Working studio location: 1254 2nd Street in the sea side village of Baywood/Los Osos, California, visits by appointment. Contact the artist by email or phone 805.234-3634. 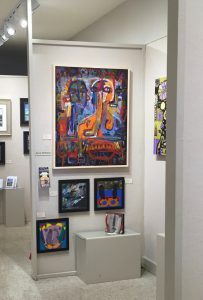 Gallery Representation: Gallery Los Olivos located at 2920 Grand Avenue, in Los Olivos, California. Opened daily 10am – 5pm. Other: Freelance Column writer for the vision arts section for Lavish Magazine and for Bay News, Tolosa Press, San Luis Obispo, Ca 2010-2018. I have always believed that my work is a balance of planned reality along with chance occurrence. 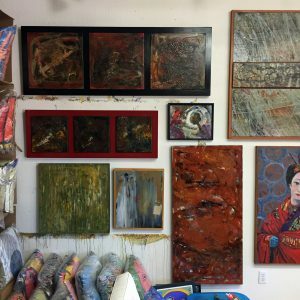 Working with mixed media has allowed me the opportunity to take risks, to learn, maintain a sense of play, and ultimately create my artistic vision that becomes a sense of reality for that time in my life. Education, self taught or formal training, is the window to the world of Art, and in its relationship to individuals, civilizations, and the order of nature. Looking back through the years, the images I have produced, has become my personal history, my legacy. Current trends and emotions influence the order to my art work. There is no constant except for making Marks. This I do on a daily basis. It is this act;”mark making”; that offers me my sense of purpose, personal balance, and visual identity. It’s my simple starting point to an end that is not forseen.